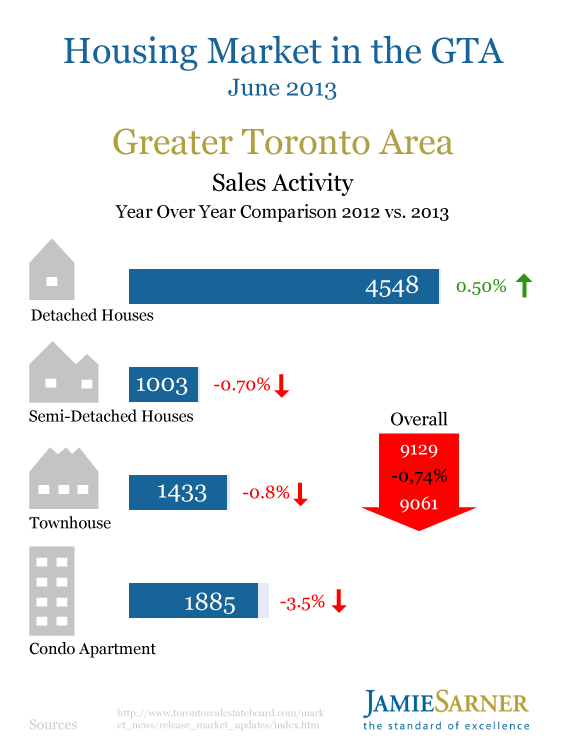 The latest figures of Greater Toronto Area REALTORS® suggest a substantial improvement in housing sales. 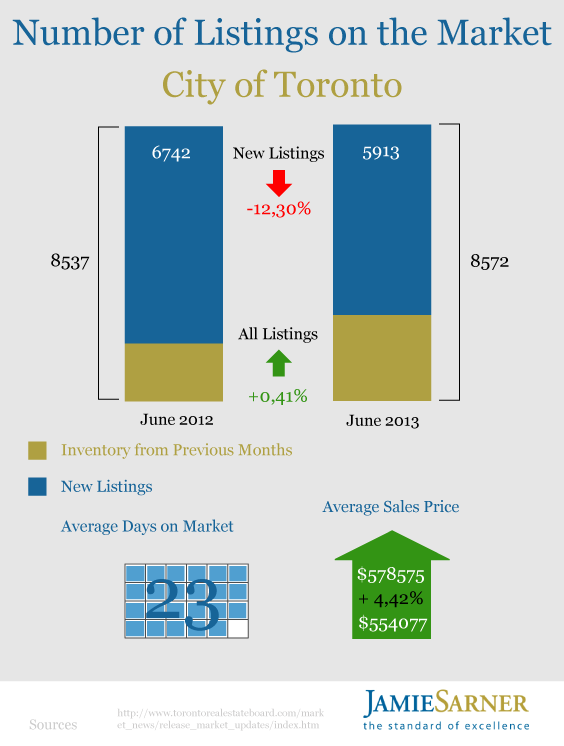 The 9,061 sales recorded through the Toronto MLS System in June 2013 represent a decrease of less than 1 per cent year-over-year. The rate of sales decline was significantly lower than in the first quarter. 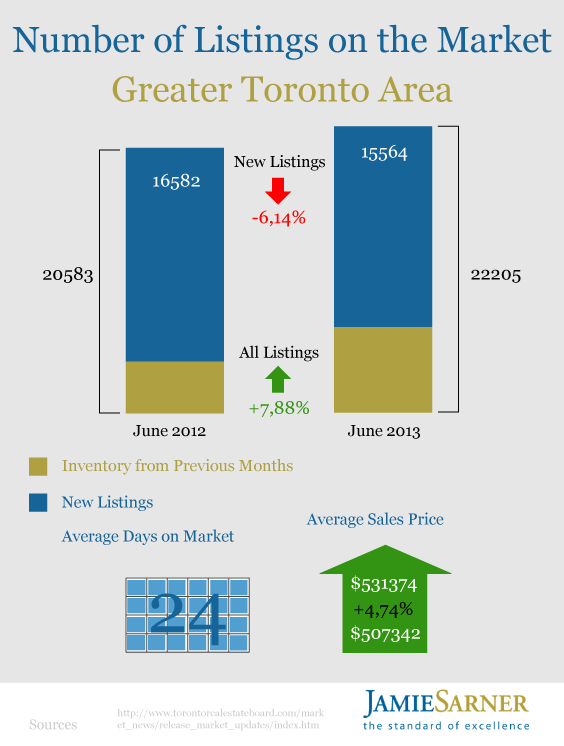 Furthermore, the GTA housing market experienced a steeper decline in new listings than in sales, indicating tightening market conditions. New listings in the City of Toronto slumped by 11.7 per cent, while listings in the 905 area went down just by 2.3 per cent. 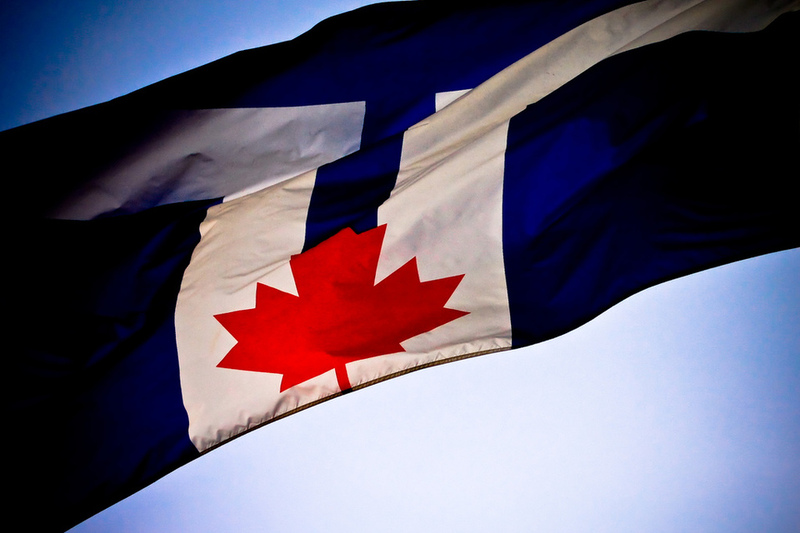 According to Toronto Real Estate Board president Dianne Usher, we can expect a rise in home sales in the second half of 2013, as an increasing number of homebuyers who postponed their purchase due to tight mortgage lending rules are re-entering the market. The short supply of low-rise home types in many parts of the GTA relative to the number of households looking to buy continued to prompt strong upward pressure on selling prices of singles and semis. We have also seen enough buyers in the better-supplied condo apartment market to provide support for selling prices at current levels. These numbers indicate that the GTA housing market continued in a stabilizing trend in the second quarter, despite a slower start to the year. Buyers are returning to the market, often with larger down payments than before the implementation of stricter mortgage lending rules, which reflected also in the demand for luxurious properties. 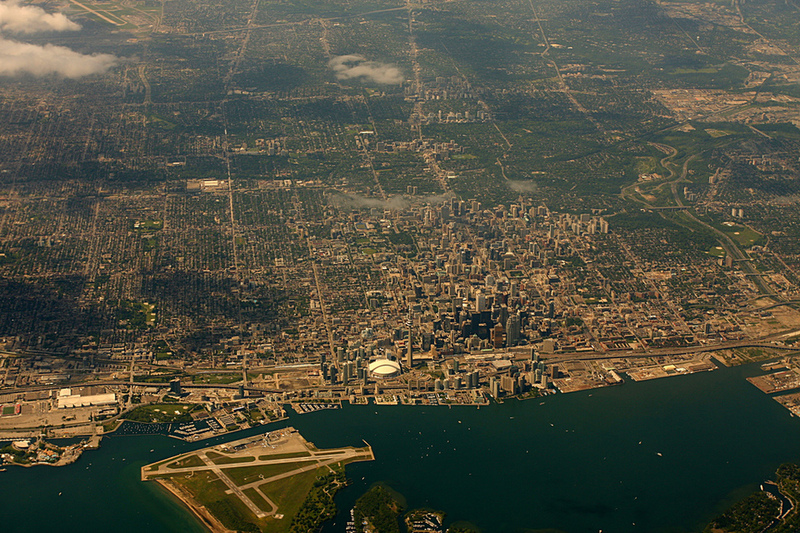 Sales of homes over $1 million went up by 59 per cent in the first half of 2013 compared to the last six months of 2012. Even though the recent numbers showed some positive trends, the Toronto housing market is at risk of rising mortgage rates, which have slowly started to increase in the past two months after being at all-time lows since the economic downturn. According to a recent survey conducted by Bank of Montreal Canadian homebuyers do not expect mortgage rates to increase and could be caught off guard. 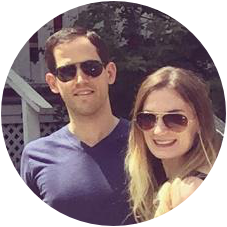 The survey informed that one-third of first-time homebuyers expect interest rates to stay the same over the next five years. Once house prices start to fall, the outcome is unpredictable. It could be that once consumers start to expect prices to fall, the reduction in demand will be larger than it needs to be (based on economic fundamentals) and therefore price reductions will be larger than they need to be. Moreover, because “housing wealth“ is a very strong driver of job creation, what starts as a small drop in house prices can turn into a major event for the broader economy. Just three weeks ago, a five-year fixed was 2.89 per cent in the wholesale market, which mortgage brokers deal in. And they have gone up three times since. It’s a pretty substantial increase — half a per cent increase in three weeks. It’s the largest chunk we have seen in the past three or four years in such a short time. There’s definitely a risk that condo prices, which have essentially levelled off, could be under downward pressure over the next couple of years. 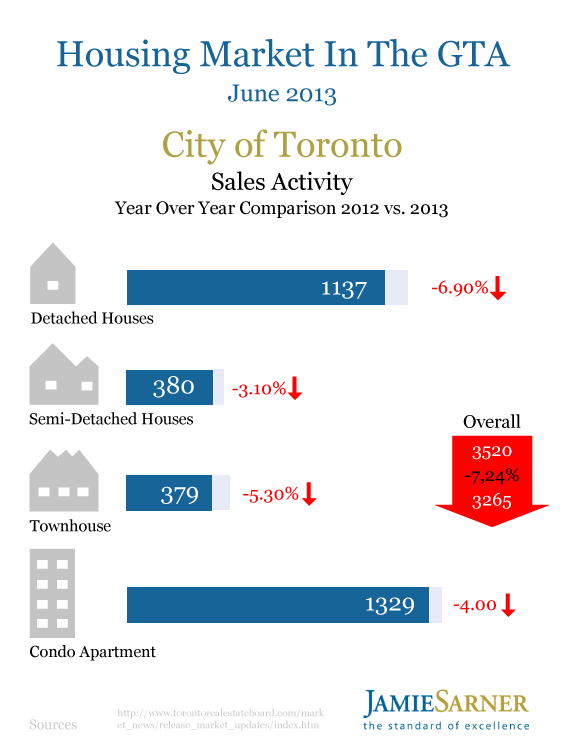 There are definitely linkages between the condo market and housing more generally. Sales in one market can affect sales in other markets. The challenge will be later on when those condos under construction are completed and entering the resale market, but time will tell if it’s oversupply. prices will continue levelling off and mortgage rates won’t surge.